RHP Keyvius Sampson made his MLB starting debut on Sunday afternoon with a well-pitched ballgame against the Pittsburgh Pirates. Sampson was not a guy on my radar, but he impressed me with good velocity and a nice-looking curveball that he seemed able to throw for strikes. Here's a profile on the latest Reds rookie to debut in their starting rotation. Sampson was drafted in the 4th round of the 2009 draft by the San Diego Padres out of Forest High School of Ocala, Florida. Sampson is the 3rd major leaguer to hail from his school, joining Reid Nichols ('80-'87) and Jonathan Johnson ('98-'03). Sampson was promoted all the way to low-A during his first season, albeit only for two games (on start). The next year, he also threw for the Padres' low-A team, though again in limited action (10 starts, 43 innings). 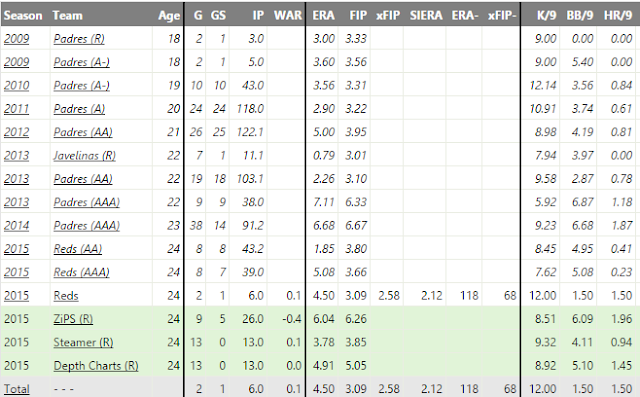 By 2011, as a 20-year old, he was pitching for their A-ball affiliate, and he progressively was promoted a level per year, reaching AAA by 2013 as a 22-year old. His minor league career started off brilliantly, with outstanding strikeout rates and acceptable walk rates to go with generally dominant performances. Marc Hulet ranked him as the Padres' #6 prospect prior to the 2014 season, praising his velocity and noting he had a "potentially plus slider" and a quality change-up, but inconsistent control. However, once he reached AAA, the more advanced hitters at that level seemed to have the distinct upper-hand. 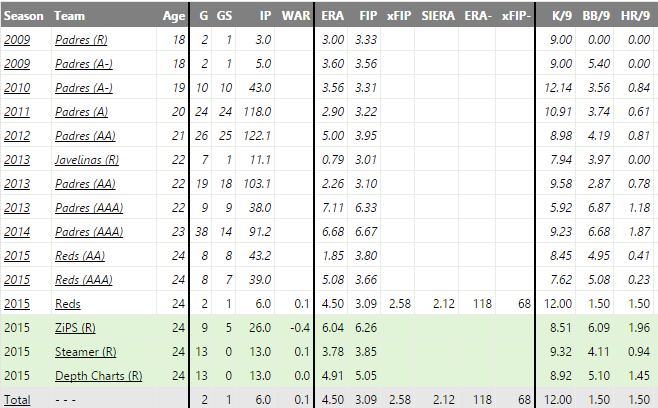 From 2013-2014, he posted an ERA in the high 6's, with a very comparable FIP. The most obvious problem was that while he continued to post good strikeout rates, his walk rates ballooned to almost 7 bb/9. In his offseason look at the Padres, Kiley McDaniel again praised Sampson's velocity and change-up, but expressed major concerns about his command and his slider. I don't know if the curve is a new pitch for him or not. The FanGraphs minor league guys always focused on his other pitches, but this tidbit from mlbtraderumors on the day he was DFA'd by the Padres this offseason mentions him scrapping the pitch. Nevertheless, Sunday he was throwing it 23% of the time, and to great effect: Brooks Baseball describes it as generating an "extremely high number of swings and misses" compared to other curveballs. It is the pitch that stood out to me watching him. I saw him drop it in for a strikeout looking, and then saw it drop into the dirt to induce a chance. The pitch looked great; hopefully he can repeat that next time. It's tempting to go further with this, but with only one start to chew on I think it'd be grasping for signal amongst too much noise. 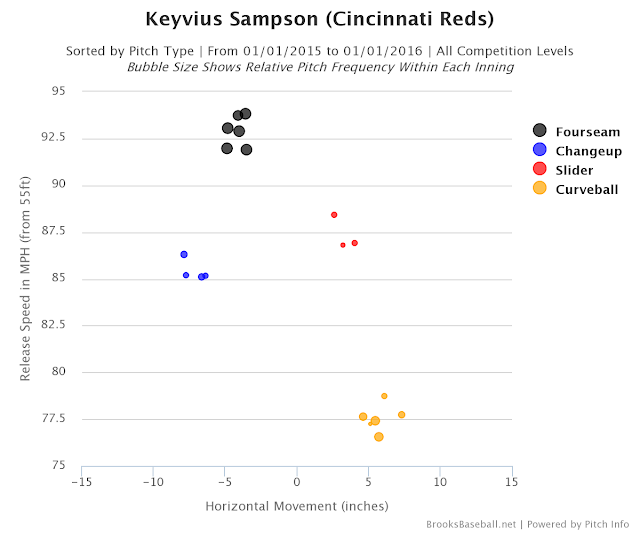 The challenge for the Reds, and for Keyvius Sampson, will be to keep him throwing the ball over the plate over the remainder of the year. If he can do that, I'd wager he has the stuff to have some success. If not, things won't be pretty.